In a world where contractors are notorious for bad service, hidden fees, and even swindling the people who work for them, Nelson Construction and Renovations has always striven to do everything above boards, to do high-quality work, and to provide excellent service to homeowners, business owners and investors all over Tampa Bay. In recent months they have expanded their design department to provide stellar design work. Homeowners can expect a truly turn-key service, from design to completion. 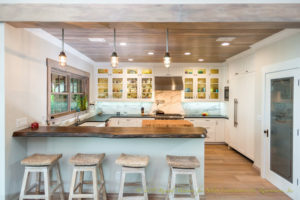 Led by General Contractor Greg Nelson and his wife Dominique Nelson, the Clearwater-based company has spent many years perfecting their system into an organized, service-oriented approach. Their projects have included award-winning historic restorations, whole home remodels, tear-downs and new-builds, large home additions, and custom new-builds. Additionally, they have done a great deal of commercial work for local businesses including American Power and Gas, Fit Life Foods, Panera Bread, Nationwide Title Clearing, Co-Cre8 Salons, and Anytime Fitness. The Best of Houzz 2017 Award comes at a time of tremendous growth for the company, and they are honored to have received this recognition from the largest and most influential directory of remodeling and design professionals.